Do you live in a country that blocks access to popular sites like Pandora or Google Play? 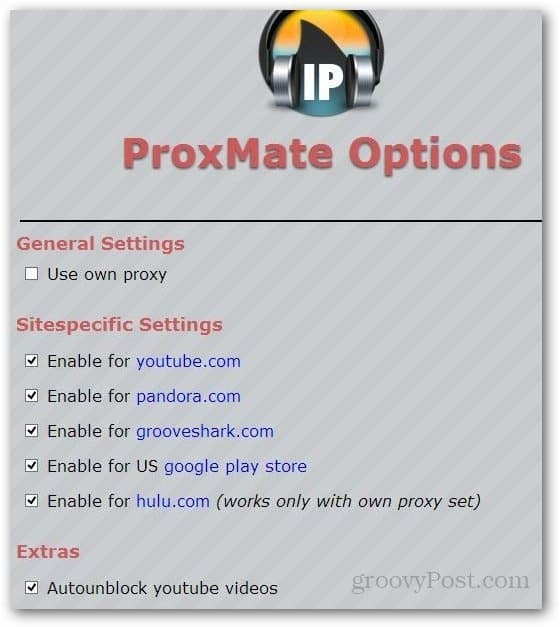 The Proxmate add-on makes it easy to access them by proxy. If you live in Pakistan, Iran, or China or other countries where websites are blocked by the Government, then ProxMate is extremely handy. Most Governments block the website by their domain name and by proxies. Even if the government blocks specific proxies, due to the always changing and increasing amount of proxies, it’s impossible to block them all. ProxMate is an extension for Google Chrome that allows you to browse the Internet and access sites that have been banned or restricted in the country. This may include websites like: Facebook, YouTube, Google Play and Pandora to name a few. First, install ProxMate for Chrome of Firefox. Then you have the option to enable or disable the add-on for different websites. By default it uses its own set of proxies. One of the best things about this add-on is that it lets you add your own set of proxies too. Another groovy feature is automatically unblocking YouTube videos. Of course you can add your own proxy to your browser, but ProxMate makes it a lot easier to get to some of your favorite popular sites that are blocked in your area of the world. Oh, and it doesn’t keep track of your browsing history either.